All transactions are safe and secure with a reliable history in online purchasing behind each of our associates. Buy the Fight Club Life Ending T-Shirt to own Fight Club clothing and merchandise. 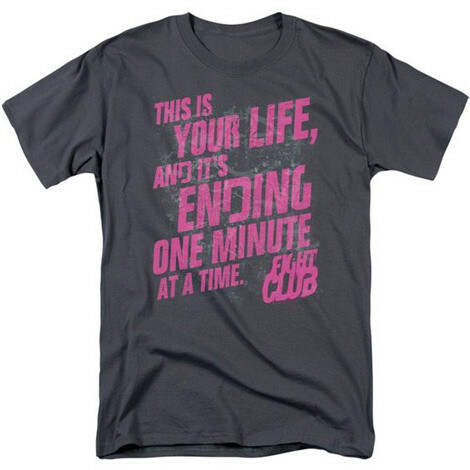 A great addition to our selection of Fight Club t-shirts, the This is Your Life Fight Club tee displays Edward Norton's quote from the movie, "This is your life, and it's ending one minute at a time." Wear this tee to remind others that the marrow of their life is being sucked away by consumerism and occupations like the Narrator's mind-numbingly dull job in the Federated Motor Corporations's Compliance and Liability Division. It is part of what drives him to participate in and follow the rules of Fight Club, Tyler Durden's underground organization for bare-knuckle fighting. In addition to the Fight Club Life Ending T-Shirt above, browse the Fight Club Clothing Gallery for more apparel like men's and women's clothes, kids shirts or hoodies.